One of my absolute favorite ways to use my essential oils is through a diffuser. The aromatic qualities of essential oils are amazing! They can balance moods, cleanse the air and open your airways. I love trying out new essential oil diffusers, so I was excited to receive a GreenAir Serenity diffuser to review. I’ve been using it in my bedroom for a few weeks, and so far I like it. I chose the Serenity model because it will run for up to 8 eight hours, and I was looking for something that would run throughout the night. I like to diffuse a Respiratory Blend of essential oils at night because it keeps the airways open so there is less snoring and less coughing. While it’s a bit noisier than one of my other diffusers, it’s half the price and the noise it does make it almost like a white noise machine. You hear the water bubbling around as it diffuses the essential oils into the air. This would be great for someone that lives in a noisy area. The water tank holds 200 mL of water, and you just add 5 drops of essential oils to it. It seems to put out a pretty good mist. It covers up to 400 square feet, so it easy fills our bedroom, and would even work in a larger room. The only thing I wish I could change is the Blue LED, which stays lit while it’s running. I like to sleep in total darkness, so we just make sure to angle it so that the light isn’t shining directly at us. Unlike my other diffusers, it only requires water for cleaning, so it’s pretty easy to clean the chamber. Overall, the GreenAir Serenity diffuser is a good value for the price. It’s available for purchase on Amazon.com. You can also check out GreenAir on Facebook. One lucky reader will win a GreenAir Serenity Diffuser during the Spring Into Green Giveaway Hop. Click here to enter – the grand prize is valued at $838! I love essential oils and diffusers!!! The diffuser does help with both mine and my husband’s breathing at night. Thanks for a wonderful and informative review. I have been looking to get a nice diffuser for a while now. This sounds wonderful and perfect for my needs. This is something i would love to put in the bedroom. I have never used a diffuser so its something new to think about. Thanks for the info and the great giveaway. I haven’t tried essential oils yet but I am looking into it and this seems like a great way to transfer it around the home. I am new to the essential oil scene and want a diffuser so badly!! But i never know which to buy! This one sounds great! !I would be totally fine with the white noise!! And I’ve gotten used to sleeping with a light since I leave my Himalayan salt lamp on all night. Oh no! What brand of essential oils did you go with? 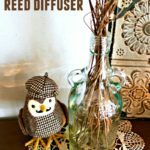 I would love to win the diffuser! I have never used one of these or essential oils but after reading recently about some of the benefits of them I am more inclined to try them. I don’t mind that it is a bit noisy since I sleep with a sound machine anyway. This would be pretty awesome to have and be able sleep with. I’ve been wanting to incorporate some essential oils into my home. I have heard such great things about them for aromatherapy uses. I think a diffuser would be a must. Thanks for the review. This is a really nice diffuser! I have wanted a couple of them to use for essential oils to make the home smell nice. They are kind of expensive so I stopped looking. Maybe I ought to take a closer look at this one. I have never used a diffuser before but I love essential oils and I think this is the next step. This product is really nice and I would love to have one like this to use with essential oils. The design is really cool! I am just learning about the benefits of essential oils and their many uses. I really like the look of this diffuser — very sleek. i love the idea of a diffuser. i wish they werent so expensive though. the non topical application is how i prefer my oils! I’m just starting to investigate essential oils. We’ve used some with our daughter and they seem to be effective. I’d love to try out a diffuser. My son has a lot of allergy issues, and I would love to use one of these to diffuse a breathe type blend or something similar for him at night! I don’t think the white noise or light would bother him at all! I’ve been getting more interested in essential oils but I don’t have a diffuser yet! I’d love to try this one! I started using essential oils several months ago and I have been researching diffusers. I have read great reviews of Greenair products and the white noise produced by this model would actually be beneficial for me because I am a light sleeper and I am often awakened by my pets running amok during the night. There’s nothing more comforting or invigorating than a home scented with essential oils. I’ve never had a diffuser like this, maybe I’ll give it a try. Thanks Chrystal !